Vieux Nice is a unique area on the French Riviera with charming old streets, colorful shops and cafes, however given its popularity, finding a spot to park your vehicle is not easy. There is almost no free street parking available, and even if you are able to find a spot on one of the narrow streets the metered parking time is limited to two hours. In practice most visitors choose one of the five paying car parks, which operate around the clock and almost always have parking lots available. 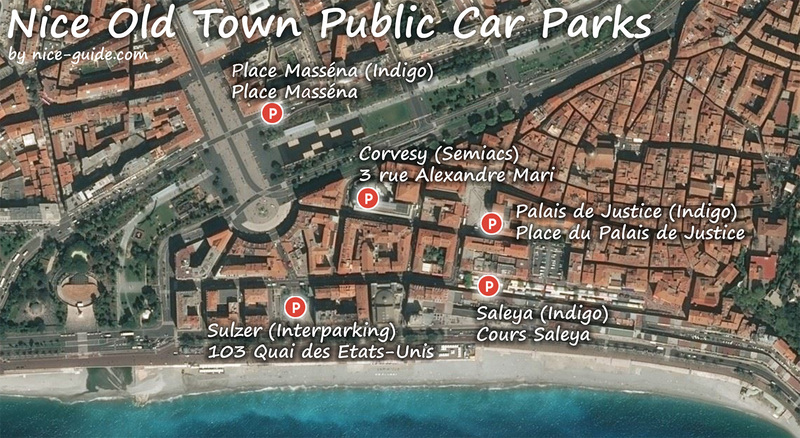 We provide an overview of the most convenient car parks in Nice Old Town below. The Sulzer car park is our favorite options in Nice. It is operated by Interparking and is clean, modern and spacious. 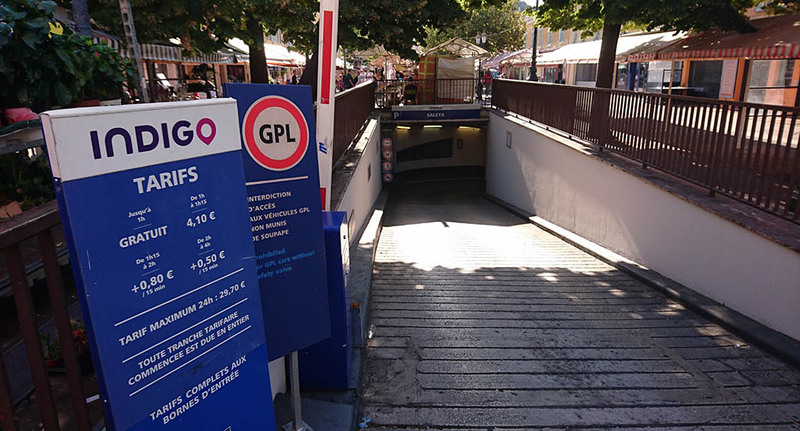 It has been in service since only 2013 and compared to other public car parks in the Vieux-Nice area is by far the most modern and pleasant. It has 455 underground parking lots and the first hour is free if you manage to stay less than an hour (otherwise you will have to pay for it). The exit takes you by elevator to a green square (Esplanade Georges Pompidou) overlooking the sea and less than 100 meters from place Masséna, and a similarly short distance from the Nice Opera house. Prices range from Euro 4.10 for an hour, Euro 5.90 for two hours and 27 Euros for one day. 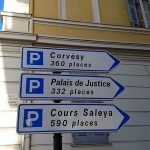 The Corvesy car park occupies a building on the recently renovated rue Mari about half-way between place Masséna and place du Palais de la Justice. While the car park itself is somewhat less spacious than Sulzer, it’s easy access from place Masséna make it quite popular. The Saleya car park is located under the Cours Saleya flower and food market. It is also steps away from the palais de la Préfecture and the chapelle de la Miséricorde. This car park is underneath the place du Palais de Justice – for many the center of the old town. The courthouse is located on this square as well as several popular cafes. It’s the closest car park to place Rossetti as well as the eastern part of the old town. Finally, Indigo operate another car park on the masséna square. 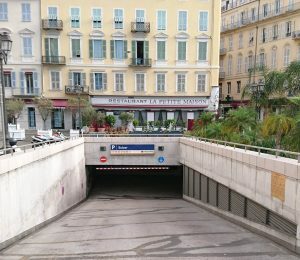 It is rather dark with what feels relatively narrower parking lots and difficult access, however you are on the main square in Nice and can easily access the old town as well as Promenade du Paillon, avenue Jean Médecin and rue Masséna shops and restaurants once you go overground. Note: metered street parking is free on Sundays and at night after 8pm, however finding a free spot is challenging. 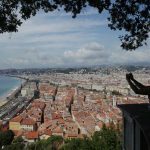 We love the city of Nice with its great combination of culture, weather and seaside and we were positively surprised to see that many others agree. 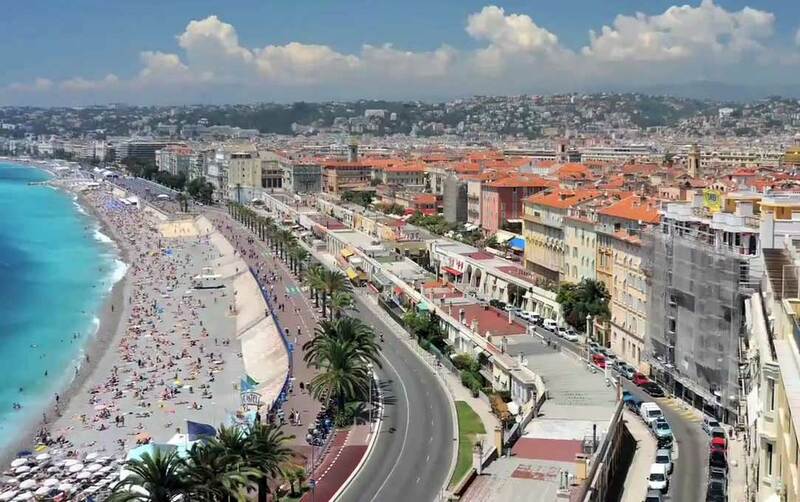 According to Atout France – an agency promoting tourism in France – Nice is the favorite destination for foreign tourists in the country (outside of Paris, which is of course in a league of its own). 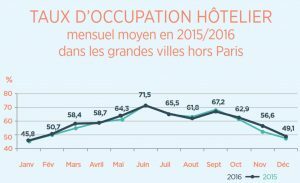 Based on a study of hotel occupancy at 2’700 hotels in 30 French cities, foreign tourists booked stays for a total of 2.65 million hotel nights in Nice in 2016. Marseille and Strasbourg come in second and third in the ranking with 1.3m and 1.1m nights booked. Foreign travelers represent almost 30% of the demand, while locals make up the remainder. The data also shows that foreigners have come in smaller numbers in 2016 than in the previous year (-2%), while French tourists traveled more (+5%). The nationality split shows the British nationals were the largest visitor group at 2 m nights, followed by the Germans at 1.5m and the Americans at 1.1 million. Note that these numbers represent the total number of nights spent in the 30 cities, while the number of actual visitors will be lower as on average these visitors booked stays of 1.8 nights (ie almost two days). What is not surprising is the seasonality visible in the data, given that most tourists prefer to come here during the warm summer months. Peak summer seasonality is over 20 percentage points higher than occupancy in the winter. Although not covered by this study, hotel room pricing follows a similar path with prices in the summer 60%-100% higher than during the low season. Although summer is the most popular season, events and conferences held throughout the year attract tourists and professionals to the city. Among notable events held in and around Nice, there is the Carnaval de Nice (February), Nice Côte d’Azur Boat Show (March), Baie des Anges Regatta (April), the half Marathon (April), Monaco Formula 1 Race (May), Fête de la Musique (June), Ironman Triathlon (June), Nice Jazz Festival (July), Septembre de la Photo – photography exhibitions (September). In 2019 the Ironman World Championship will be held in Nice. Why another Nice travel guide you may rightly ask? There certainly is a good amount of information online about Nice and the French Riviera already. However authors focus on different aspects. We like to explore cities and towns on foot as much as possible, we like outdoor activities – walks, treks, cycling and swimming – and we have an interest in history and culture. It is in this spirit that posts will be presented, targeting similarly-minded travelers, Côte d’Azur residents and aficionados. We hope to present our impressions and and experiences objectively but with a personal touch and hope to receive your feedback and reactions. Through this exchange, we hope to inform others and become better informed ourselves – while having fun in the process.